The Great Chicago Fire Festival is planning to return for a second year with the city's support after pyrotechnic problems put a damper on the inaugural event last fall. 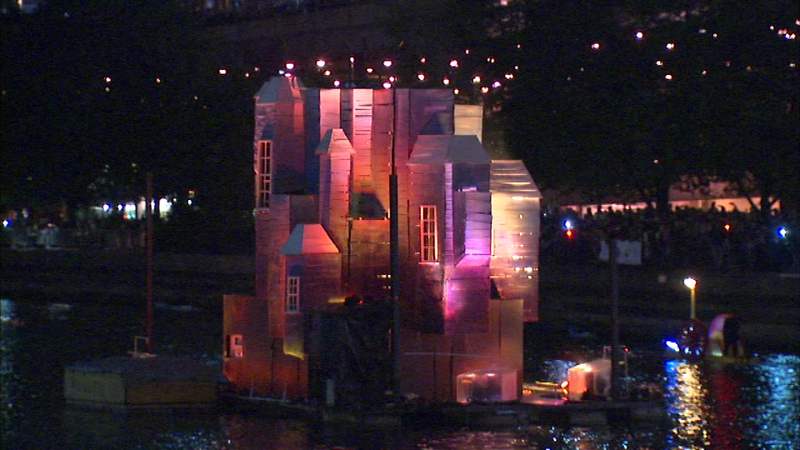 CHICAGO (WLS) -- The Great Chicago Fire Festival is planning to return for a second year with the city's support after pyrotechnic problems put a damper on last fall's inaugural event. The city's Department of Cultural Affairs and Special Events said it has budgeted $100,000 to support the 2015 event, which will be again be produced by Redmoon Theater and the City of Chicago. Organizers had promised a big fire display for the first Great Chicago Fire Festival held in October 2014, but in the end it didn't quite meet expectations. Crowds were disappointed when the spectacle of fire ended up fizzling on the Chicago River and elaborate sculptures of Victorian homes did not go up in flames like they were supposed to. Organizers blamed heavy rains for an electrical malfunction. "Last year, despite technical difficulties, 30,000 people enjoyed a neighborhood bazaar along the banks of the Chicago River, poetry and dance stages, music by the Chicago Children's Choir and a spectacular fireworks show. This year we expect a successful event that will continue to support the arts and culture in Chicago, which is essential to the city's future growth and competitiveness," said Jamey Lundblad, a spokesperson for the DCASE. A date has not yet been determined for the 2nd annual Great Chicago Fire Festival.